So why is this so hard? If we can send a man to the moon, why can’t we quantify Facebook activity? Well, therein lies part of the problem. 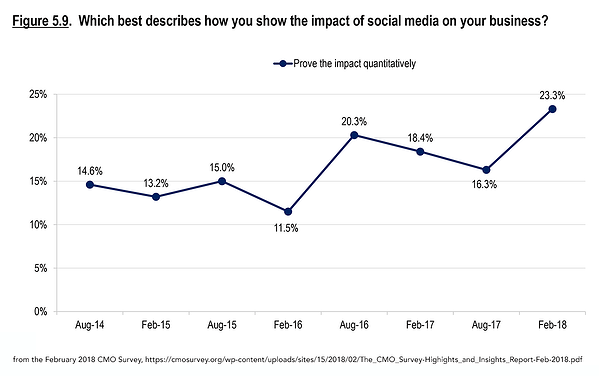 Measuring social media is dicey for a number of reasons, but one of the biggest is because every social media platform measures activity differently. Also, because different social media platforms have completely different functionality, there’s no way to bend the definition of most metrics so that all the platform metrics can “talk” to each other. Oh, you get the idea. It’s a headache. That said, despite all the challenges of measuring social media effectiveness, some companies have solved the mystery. You can see this plainly in the first chart. 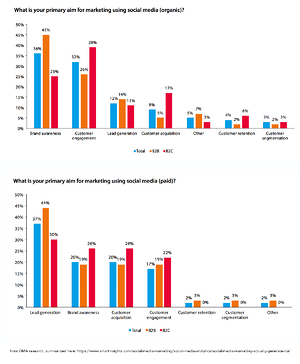 23.3% of CMOs do know the impact of their social media work. It can be done. Now, we hope you’re on the team of one of those CMOs. But if you’re not, maybe you can get there. The exact way to do this will be different for every company. And that’s as it should be: You’ve got different business goals, different tactics, different assets, a different business model. Using the exact same methodology to measure social activity as everybody else would be ridiculous. It wouldn’t work. But you can take the principles of social media measurement, and get a reliable read on what’s working and what’s not. 1. Define what “effective” means. What does your company want from its social media marketing? More revenue? More brand awareness? More social media leads? A bit of all three? Ideally, you’ll pick just one primary goal for your work, but “ideally” is the operative word there. Often, there’s a squabble between different people on your team about what “effective” means. Work this out as best you can. Get a meaningful, working definition of what “effective” means. You can change that definition next year if your business goals change. But obviously, until you get clear on what “effective” means – in a quantifiable way – it’s going to be basically impossible to measure it. 2. Assign some metrics to track your vision of effectiveness. Does “effective advertising” mean more revenue for your company? Great. The classic ROI formula will work for you. Did you want to measure brand awareness instead? Ah… that’s a squishier problem. Brand awareness is not impossible to measure, of course. But it’s not as cleanly quantifiable as revenue. However, there are companies that can measure how aware your target audience is of your brand or products/services now. And then your team can decide where you want your goal brand awareness number to be. You’ve got your starting measurement, and your goal measurement. That’s fine in the boardroom, but it breaks in the cubicle. You – the social media manager, the marketing manager, even as CMO - are going to need to measure every campaign by how much it moves the needle toward the brand awareness measurement that you want. You need an attribution model. 3. Pick the best possible attribution model for your needs. An attribution model is basically the formula you’ll use to tie marketing messages and customer actions directly to quantifiable results. In other words, an attribution model takes into account a variety of different “touches” your prospect will go through before they become a customer. It weights each touch and then assigns each touch a quantified value (in dollars) for the sale. Attribution models range from the simple to the far more complicated. For example, “last touch” is a simple attribution model. That’s where you attribute revenue to whichever marketing message happened right before the sale went through. The “last touch” before the sale happened, literally. So if the sale is worth $30, and the last touch is a click from an email that drove the customer to your site, the email message gets full credit for the $30 sale. Unfortunately, while last touch and other simple attribution models make for easier analytics and report generation, everybody knows they don’t tell the whole story of what’s happening. Here’s why: We know that it takes the average B2C consumer 9.5 visits to a website before they decide to buy. So while using a last touch model is convenient, it completely ignores any contribution from those other 8.5 visits (much less what drove those website visits). If you’re in B2B, the sales funnel gets even more complicated. It’s not uncommon for B2B marketers to have a sales cycle of six months or more. And remember – every sales process (aka “customer journey”) is different. We consumers don’t move through sales cycles all in the same way. So suffice it to say, there’s just a lot to track. Which is why we have attribution models. Think of them a bit like simple customer journey tracking algorithms. This complexity gets particularly funky for social media. Even if you just optimize all your social media marketing for clicks, and add a set value to each click (either based on what you pay for social clicks, search clicks, or organic clicks), you could still miss out on quantifying some the benefits your social media marketing delivers. Especially if your goal is, say, brand awareness. All this complexity is at the core of why marketers struggle to know if their social media is effective. Many of them know, intuitively, that it is – but they can’t prove it on paper. Which is, again, why we use attribution models. They certainly aren’t perfect, but they’re much better than just throwing your hands up. A well-implemented attribution model can give social media the credit it is due, while still weighing all the other steps your prospect goes through along the way. Again, it is definitely not perfect, but it can be good enough to make decisions from. The question, of course, is which attribution model to use. That’s really for you and your CMO, your CFO and your team to figure out. 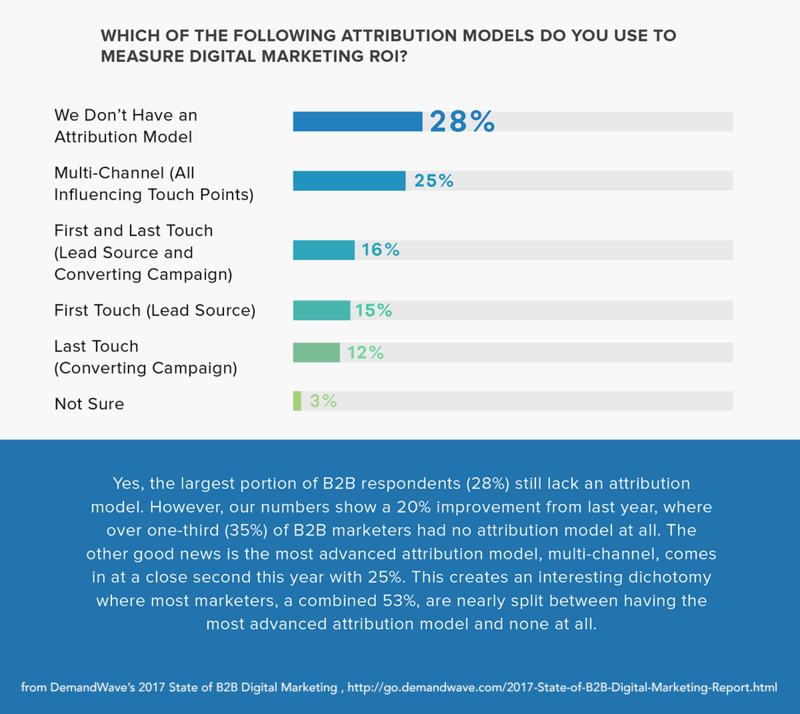 But for reference, here are the most commonly-used attribution models for B2B marketers. After you’ve got an attribution model, all that’s left is to plug in your data (we recommend using our new Calculated Metrics Builder to make this easier). You’ll get back a measurement of how effective each of your marketing campaigns are. Now, is it gospel? Hardly. It’s an educated guess. In Zen-speak, you attribution model is the finger pointing to the moon - not the moon itself. But it’s as accurate an analysis as possible. And you can confidently run a business, manage your social media campaigns, and invest in resources accordingly. Word to the wise: Every CMO I’ve ever come across will ask you to run more than one attribution model. So even when we have our snapshot view of “this is our best, data-driven view of what’s going on,” they’ll want another view of it. And this makes sense. It’s smart to take attribution models with a grain of salt. But they’re good at dispelling cognitive biases we may have (I know Snapchat works… we just can’t prove it yet.”). But they’re still a model. Sometimes data models fail. But they’re good enough to trust and take actions from. And that is the ultimate goal of all this data we have – to show us which actions to take. 4. Figure out what it cost to achieve your results. This is in some way the easiest part of measuring social media effectiveness. You do it because to get a true return on your investment, you’re going to need to know what your investment was. If you have people dedicated to social media, this is easy. But you probably have a couple of people who contribute to your social media work part time. Ask them roughly what percentage of their time goes into social media, then allocate that portion (including benefits and all other employee costs) to the staff section of your social media costs. Got any freelancers who contribute to social media? Add up their costs here. · Tools, software, services, etc. Use a social media scheduling tool? Add its cost here. · Advertising and promotion costs. This is trickier than it sounds. For example: You publish a blog post. It costs $900 all in. You publish it on your blog but it also goes into your email newsletter, and you share it several times on social media. Is it fair for your blog to bear the overhead burden for the whole blog post, when your newsletter and your social media marketing get benefits from that post, too? Most marketers would say no. So they might attribute 10% of the cost of the blog post to both the newsletter and social media each. The blog itself would only “pay” for 80% of the overhead for that post. Let’s bring all this complexity into perspective. At it’s simplest, achieving social media effectiveness just means you’ve achieved the goal you set for yourself on social media. If your goal is clear, it’s not hard to tell if you’ve done that. Of course, as business people, we want to quantify our marketing goal and its achievement better than “I achieved my goal – good for me!” So we’ll specify what our goals are. We’ll set measurable goals and give ourselves a deadline to achieve those goals. Again, it’s not so hard to tell if you’ve achieved a goal or not. No rocket science required here. But because we’re wonky businesspeople, we’ll also want to know if we achieved our goal in an affordable way. So when we set out to achieve our goal, we allocate a bunch of resources into achieving it. And we keep track of how much those resources cost, so we’ll know how much it took to achieve our goal. If the results of our goal are worth more to us than what value of the resources we put in, we’ve got a positive return. Our social media marketing was effective. Now, that’s certainly not the classical definition of ROI, but this simplification can help. It’s a plain way to think about the resources we put in, and the results we get out. Or, in other words, if we achieved our goals at a price we’re happy with. Where are you at with this whole issue of tracking social media effectiveness? Does your company use an attribution model, or can you say with confidence that you know your social media work is effective? Leave a comment and tell us what you think.